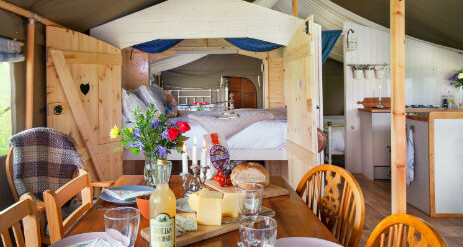 Lower Keats Farm offers glamping in Safari Tents near Axminster in Devon. The beautifully appointed six large canvas lodges set in the Axe Valley adjacent to the River Axe and only 15 minutes drive from the Jurassic Coastline allow you to immerse yourself in a simpler way of life. 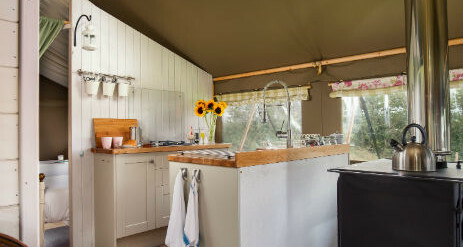 Our lodges have their own kitchens and ensuite bathrooms, with hot running water, proper beds and wood burning stoves to keep you snug and warm. 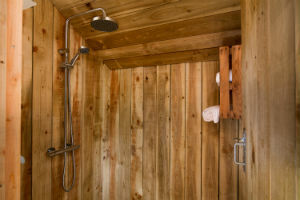 No cold midnight treks to the loos or cold showers here! We have thought of everything, including an additional two ring gas hob, for that early morning cuppa or cooking without the need to fire up the stove. All you will need to do is sit back and enjoy your stay. 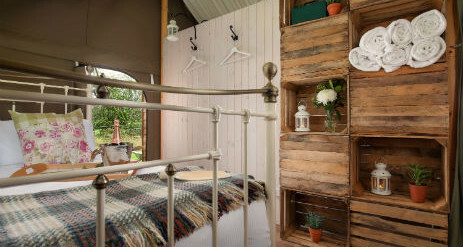 Lower Keats Glamping is the ultimate destination for luxury camping. Lush green pastures and unadulterated night skies offer the chance to truly unwind and escape the hustle and bustle of everyday life. 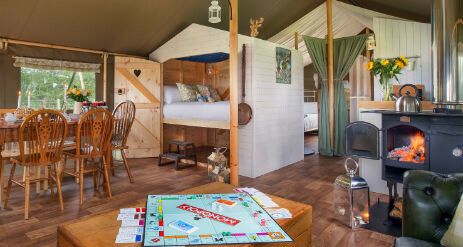 We hope we have created the perfect family or romantic getaway with coastal and country themed lodges with luxury indulgence with country charm. We are on the Devon, Somerset and Dorset borders, so the West Country really is your oyster. 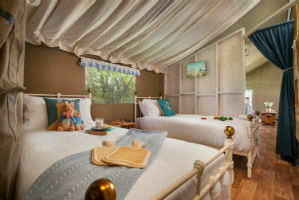 Our 6 safari tent lodges comfortably sleeps six plus a cot. Three of our lodges are named after local coastal places of interest: The Cobb, Beer and Golden Cap. 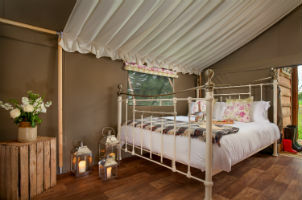 Another three lodges are named after animals that you are likely to see during your stay Deer, Stag and Pheasant. Warm coats, socks, shoes and boots, hats, gloves and scarves, wellies and or crocs, rain gear, swimsuits, beach towels and torches. We hope you enjoy exploring Lower Keats. You can meet and feed the animals, collect the eggs, help with farming duties or simply use us as a base to explore the beautiful countryside. 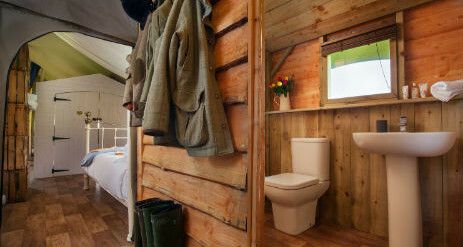 We stock a small range of camping and glamping essentials. 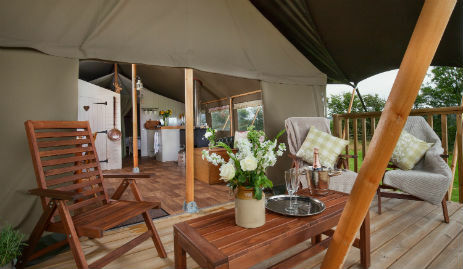 Provisions include delicious local produce, ice creams, drinks and picnic snacks. Milk, dairy produce and fresh bakery are delivered daily. We are the perfect place to explore the amazing Jurassic Coastline and we have a fantastic collection of National Trust properties, gardens and walks in the area. Axminster is our local town situated on the River Axe. This attractive ancient market town lies in the beautiful Axe Valley, an Area of Outstanding Natural Beauty. The River Axe neighbours our land and the fish life in the river includes salmon, bullheads, otters and kingfishers. River Cottage Canteen & Deli in Axminster is the perfect place to enjoy fresh, seasonal produce transformed into delicious dishes with a tasty River Cottage twist.​ At the coast in Lyme Regis is the famous ​HIX Oyster & Fish House. Charmouth Heritage Coast Centre – Visit David Attenborough’s Sea Dragon!